The product is RND Head Framing Nailer. Easy to use. The product is manufactured in China. 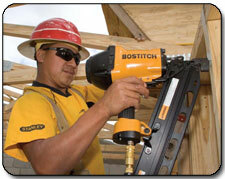 The Bostitch F21PL Round-Head Framing Nailer is the ideal tool for framing, sheathing, subflooring, and bracing jobs. Perfect for professionals and weekend warriors alike, this nailer features a strong, lightweight magnesium body, quick-change nosepieces for plastic-collated and metal-connector nails, a 16-inch layout indicator, and more. Unbeatable power-to-weight ratio helps you complete all-day jobs. View larger. are ideal for framing jobs. The recommended tool for use with HurriQuake disaster-resistant nails, the F21Pl has a patented feature that lets you set nail depth with the simple push of a button. For further convenience, quick-change nosepieces let you switch from plastic-collated framing nails to metal connector nails in seconds. The high-capacity magazine holds up to 60 plastic collated 21-degree framing nails (2.0-3.5 inch) or 60 metal connector nails (1.5-2.5 inch). Its 16-inch layout indicator, located on the magazine, lets you know at a glance the correct distance between studs. And with an adjustable rafter hook, you can conveniently hang the nailer on joists and rafters during work breaks. The magnesium construction of the F21PL Round-Head Framing Nailer means this tool is light enough to use all day, while still being strong enough to reliably use again and again. It also means that this tool has the best power-to-weight ratio in its class: 1,050 in./lbs. to 8.1 pounds. The Bostitch F21PL Round Head Framing Nailer works with a standard air compressor and is backed by a seven-year limited warranty. 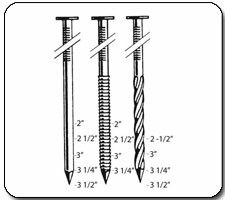 Stanley-Bostitch manufactures top-quality, innovative fastening tools and fasteners for industrial, construction, and home-improvement applications. Products include pneumatic staplers and nailers; compressors; manual staplers and tackers; coil-fed screw systems; rivet tools; glue guns; a broad assortment of collated nails, screws, staples and specialty fasteners in a variety of materials and finishes; and carton-closing staplers–many of them industry firsts. Framing nailer and two quick-change nosepieces.